Hey there, Crochet Spotters! How’s the weather by you? I know there are lots of us living in the Northern part of North America, and I understand that winter’s in full swing up there. But I’m here to tell you that warmer weather is on the way! By the time that rolls around, you want to be ready to rush out and enjoy it, right? You don’t want to be stuck in the house doing your spring cleaning. According to the calendar, we’re just a few weeks away from Passover and Easter, the harbingers of the new season, so it’s time to plan and get moving! 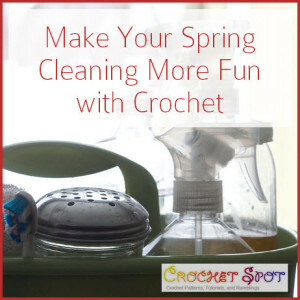 Why not incorporate crochet into your spring cleaning? I have a toddler in the house and that means that bath time is synonymous with play time! So I made this little goldfish for her to swim away with. 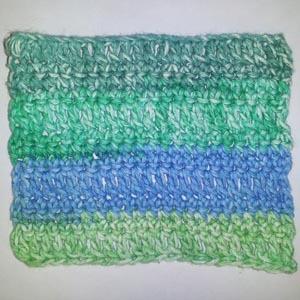 I used old fashion cotton worsted weight yarn for super absorbency. Plus, it will lather up perfectly with her favorite bubble bath. This pattern could easily be adjusted to be a soap saver too! New baby on the way? Are you looking for a shower gift? 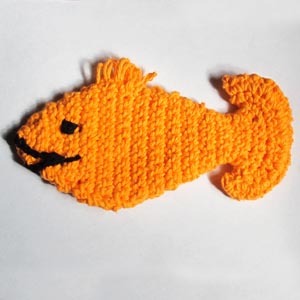 These little fish are so fast to make, why not whip up a couple and give with a set of bath towels. The new mom will appreciate their playful usefulness!